This is a comprehensive list of the Committees of Delta Sigma Theta Sorority, Inc. The Grand Rapids Alumnae Chapter Arts & Letters Committee works in conjunction with the National Arts & Letters Commission to provide artistic and cultural outlets for chapter members and our local communities. This committee is responsible for promoting a positive image of African Americans in our community through the medium of music, dance, drama, and poetry. The committee promotes worthwhile cultural endeavors and artists through events such as book signings, theatre parties, concerts, and artist showcases. This committee is responsible for planning and advising the chapter on fiscal matters. It prepares an annual operating budget and makes recommendations on local chapter dues. It recommends financial projects to be undertaken by the chapter for the sorority year, and coordinates with special committees appointed to implement those projects. This committee provides an opportunity to work with at-risk girls from the ages of 11 to 14. It meets monthly with participants and conducts seminars on subjects such as 'how to save money,' etiquette, and internet usage. Tutoring is also available. 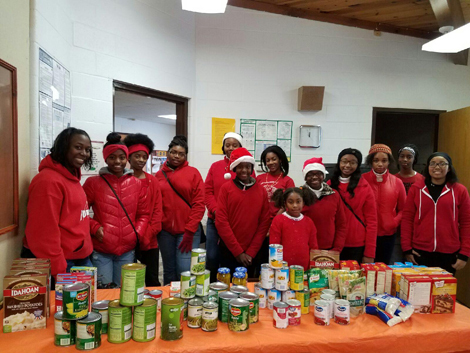 This committee coordinates a series of mental, physical, emotional, financial, social and academic programs for young ladies ages 14-18. This committee develops the rules, guidelines and procedures for chapter elections. 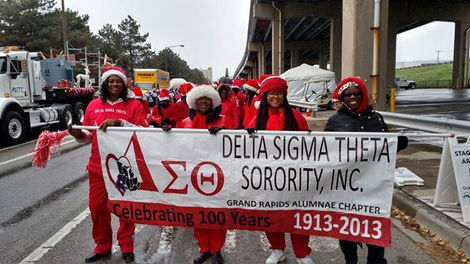 This committee recommends and implements an approved program commemorating the founding of Delta Sigma Theta Sorority, Inc. on an annual basis. This committee evaluates community programs and recommends sorority participation that supports the national physical and mental health objectives. It is responsible for the chapter's International Day of Service program. It also presents at least one workshop to the chapter on health issues pertinent to African-American women. It encourages collaboration with community service organizations. It also presents at least one workshop to the chapter on health issues pertinent to African-American women. It encourages collaboration with community service organizations. This committee documents and maintains the chapter's history via scrapbooks, files, etc. It displays archival materials at least once per year for review by chapter members, and follows National Heritage & Archives guidelines. The committee also develops a quarterly publication to document and highlight chapter events and member news. This committee is responsible for maintaining a database of all chapter members, sending written and electronic communications to chapter members. This committee audits the financial transactions of the chapter on a quarterly basis in preparation for the yearly audit and to ensure compliance to the sorority's financial guidelines. The 1st Vice President serves as the chair of this committee and coordinates and directs all membership functions within the chapter. This committee focuses on retention and reclamation. This committee is comprised of elected offices who work together to identify the best possible candidate for each elected office in the chapter. It presents a slate recommending these candidates. Members of the Nominating Committee can only serve for one term. This committee attends NPHC meetings and represents the chapter for input on joint activities. It provides updates on NPHC events to the chapter and inputs chapter events into the NPHC calendar. This committee reviews and makes recommendations on changes to the chapter's policies and procedures. The committee works with the Regional and National Scholarship and Standards Committees to ensure compliance with appropriate guidelines. This committee coordinates the investigation and implementation of new programs and the delegation and coordination of current programs for efficient operation of Chapter Projects. This committee also surveys the needs of the community, evaluates findings and makes recommendations to the Chapter of projects to be undertaken in keeping with our 5Point Programmatic Thrust. This committee plans for the annual Grand Rapids Santa Parade. This committee provides pertinent legislative updates to chapter members and community groups, as well as information on public policy and civil rights activities. It keeps abreast of the annual National Social Action Commission Plan and identifies projects for chapter implementation. Traditional activities include voter registration, and education regarding pending legislation. Annually the Social Action Committee coordinates chapter participation in Delta Days at the State Capital.